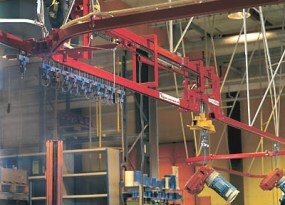 CONVOYNORT's manual conveyors can be set up as transfer conveyors using travelling bridges cranes. 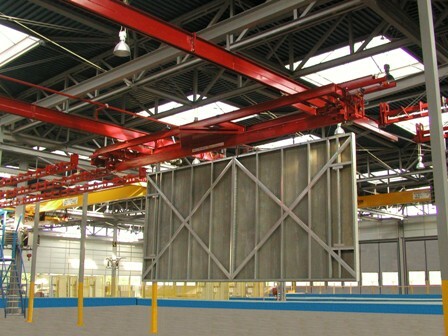 Travelling bridges cranes are highly flexible and achieve significant space gains. 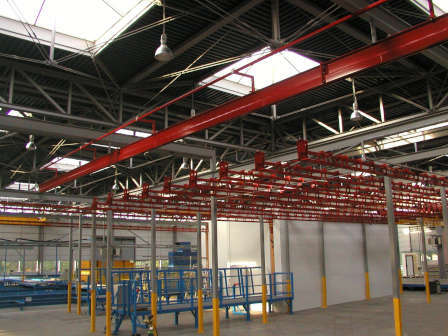 Primarily used in painting installations or working station improvement, this system makes possible to combine both handling and sorting needs. Fixed rails installed on either side of the travelling conveyor are used for stocking buffer. The manual monorail can be used as travelling bridge crane. 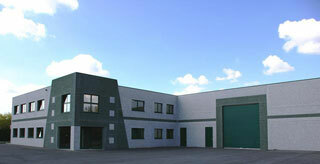 Here, to introduce several loads at the same time in a curing oven, to reduce the door opening time. 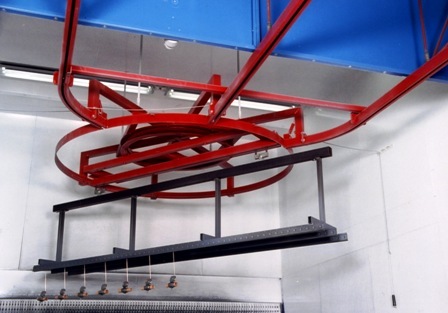 Often essential, elevators can be installed in loading and unloading areas in order to make easier work for labourers, but also along the treatment process which transported parts have to follow or receive. The most frequent of drop sections have two maximum levels, low and high. The stroke of the lifting device is the distance between both levels. At a working station, the worker uses the remote control for choosing the needed level upward or downward. Particular case of a less usual three levels lifting station inside a painting booth. The lifting stroke is always the distance between lowest and highest levels. The intermediate level may be the arrival and exit level of the conveyor at the working station. 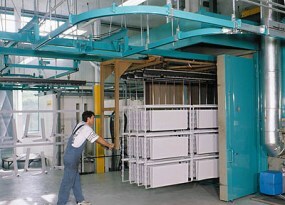 The highest level is used for painting under workpieces. 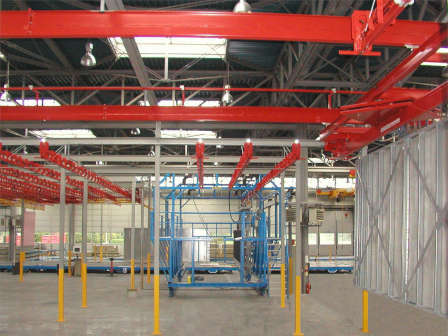 CONVOYNORT's team will answer all your need in terms of standard or particular lifting systems. The lifting device may be driven by an electric chain hoist. 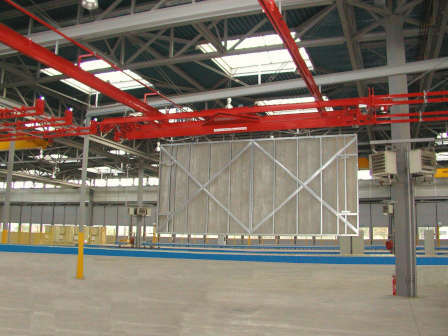 In some case,a pneumatic hoist will offer a interesting alternative to the electric in regard of ATEX norms respect. For light loads, dipping sections, lifting units, working stations, etc. may be fitted with pneumatic cylinders. 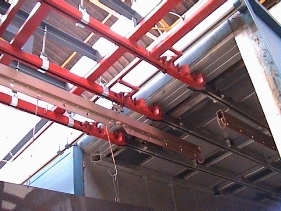 Overhead conveyor for fire door, airtight door, curtain door, etc. Retractable tracks allow continuous conveying when crossing a curtain door, an airtight door, an fire door, etc. 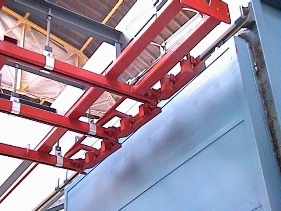 Example of conveying through a sliding airtight front door of a 250°C curing oven fitted with 3 rails. 3 combined retractable tracks are closed or open whether the sliding door is open or closed. 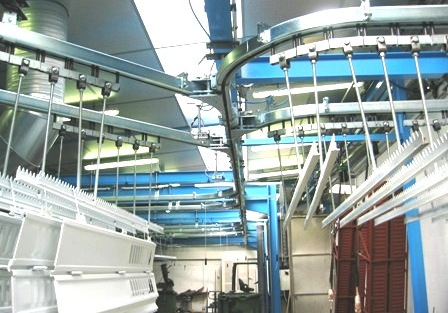 Facilities with transfer conveyors and small travelling cranes can be combined with monorail systems including switches, turntables, elevators, etc.